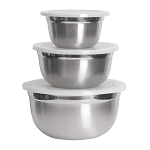 Keep food colder longer in this attractive double-walled bowl. Great for using with our vegetable choppers! Features a satin finish. Measures 9-1/2" x 4-1/2". Limited lifetime warranty. White box.